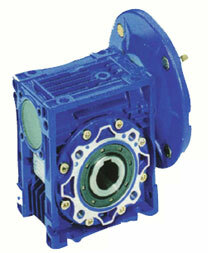 Motovario Motor ready worm units supplied with or without Output shaft, Flange or Torque arm. 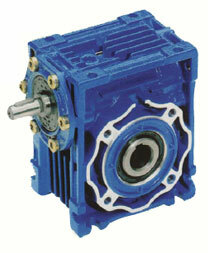 Motovario Worm geared motors & gearbox reducers. 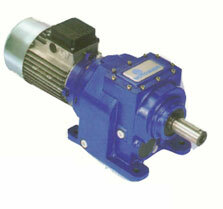 Single and double worm gear reducer; per-stage with single worm gear reducer. 11 sizes with power from 0.06 to 15 kW. Patented case with modern design. Reduction ratios between 5 and 100. Torque max 1400 Nm and admissible radial loads max 16500 N.
Cases up to 105 in die-cast aluminium alloy. Cases over 110 in G200 grey cast iron. Ground worm profile ZI (UNI4760). Load capacity calculated to BS721-83. Size 030 and over are painted with Ral 5010 blue epoxy-polyester powder. 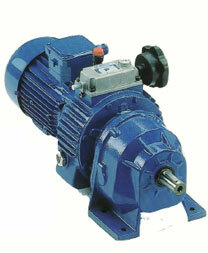 8 sizes with power from 0.12 to 45 kW and gears with shaved or ground profile. Gearing with 1, 2 and 3 reduction stages. Reduction ratios between 1,2 and 280. Torque max 8000 Nm and admissible radial loads max 55000 N.
Casing in G200 grey cast iron for high strength and optimized with FEM analysis. Excellent mechanical strength, particularly suitable to support high axial loads and high reliability. Load capacity calculated to ISO6336 and verified according to AGMA 2001-B88. All Size are painted with Ral 5010 blue epoxy-polyester powder according to DIN 1843. 4 sizes with power from 0.12 to 4,8 kW. Gears with shaved or ground profile. Reduction ratios between 1,3 and 350. Torque max 480 Nm and admissible radial loads max 8000 N.
Cases in die-cast aluminium alloy. Excellent mechanical strength while being and particularly lightweight. 5 sizes with power from 0.55 to 45 kW. Gearing with 3 reduction stages. Gleason spiral bevel gear pairs with run-in profile. Reduction ratios between 7,8 and 180. Torque max 8000 Nm and admissible radial loads max 65000 N.
3 sizes with power from 0.12 to 4,8 kW. Gearing with 2 and 3 reduction stages. Reduction ratios between 7,6 and 443. Torque max 450 Nm and admissible radial loads max 5500 N (hollow shaft) and 10000 N. (solid shaft). 3 sizes with power from 0.15 to 2,2 kW with cases in die-cast aluminium alloy. Shafts: case hardened and tempered 20MnCr5 steel (UNI8550). Variation range: i=( rpm max/rpm min). i=3,5 (TX005 / 080 engine- TX010/090 engine). i=6 (TX005/71 engine - TX010/80 engine). Torque value max 12 Nm. Control handwhel positionable on either side. Number of lost turn with motor 5% max.